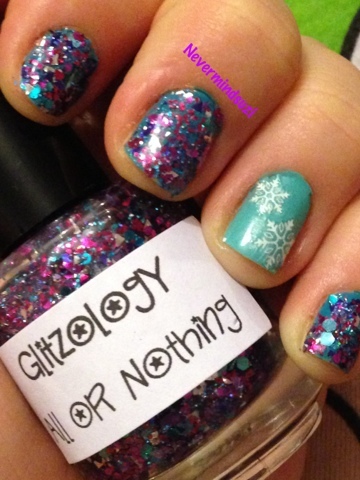 Another Christmas/Glitzology themed mani today. This time featuring Essie - Where's My Chauffeur? and some pretty snowflake stickers. 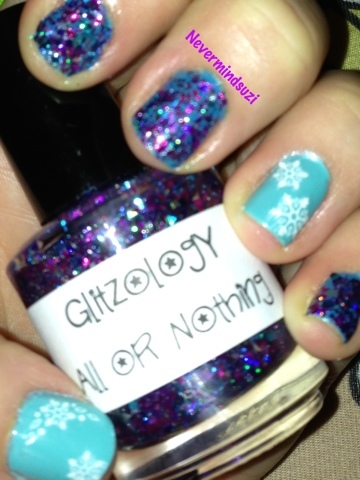 I used Glitzology All or Nothing over 2 coats of Nails Inc Kensington Park Road. All or Nothing is a clear base with pinks, blues, purples and silvers. It's a real mishmash of shapes and particles, glitters and foils. Some of these even have a lovely holographic sheen. 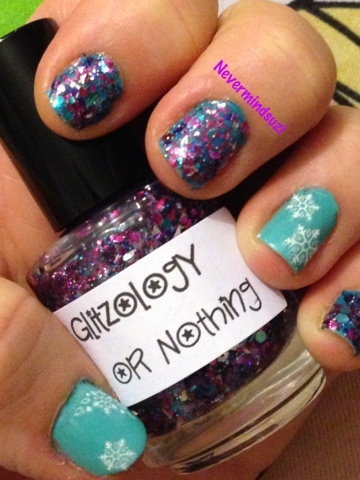 I used 3 coats of this fabulous glitter to get the density I fancied. Only thing I did wrong was not let the KPR dry enough, especially between coats that it went a bit squelchy. This is what happens though when you finish work at 11pm start back at 7am and insist on changing your nails in between lol.